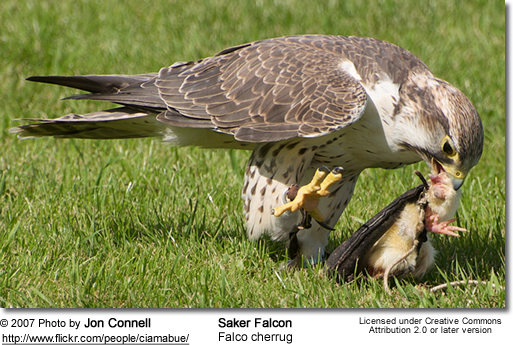 The Saker Falcon (Falco cherrug) is a very large falcon. This species breeds from eastern Europe eastwards across Asia to Manchuria. It is mainly migratory except in the southernmost parts of its range, wintering in Ethiopia, the Arabian peninsula, northern Pakistan and western China. During the end of the last ice age - oxygen isotope stages 3-2, some 40,000 to 10,000 years ago -, it also occurred in Poland (Tomek and Bocheński 2005). 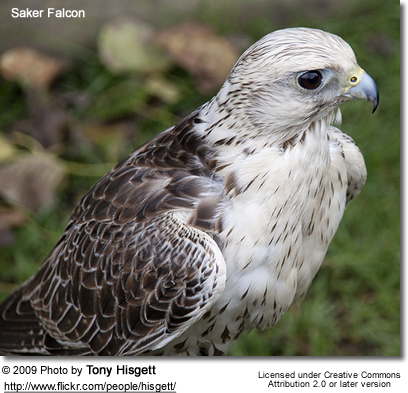 The Saker Falcon is a large hierofalcon, larger than the Lanner Falcon and almost as large as Gyrfalcon at 47-55cm length with a wingspan of 105-129cm. 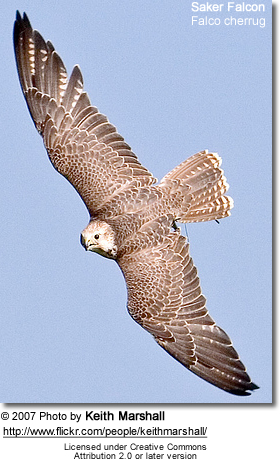 Its broad blunt wings give it a silhouette similar to Gyrfalcon, but its plumage is more similar to a Lanner Falcon's. 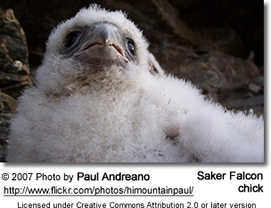 Saker Falcons have brown upperbellies and contrasting grey flight feathers. The head and underparts are paler brown, with streaking from the breast down. 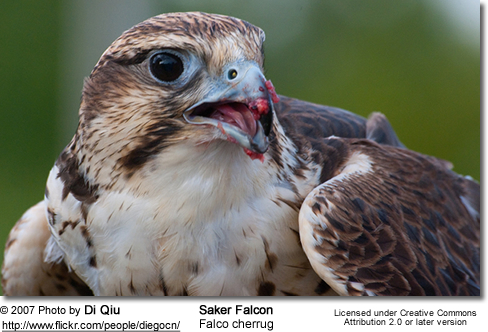 Males (called sakrets in falconry) and females are similar, as are young birds, although these tend to be a duller brown. The call is a sharp kiy-ee. 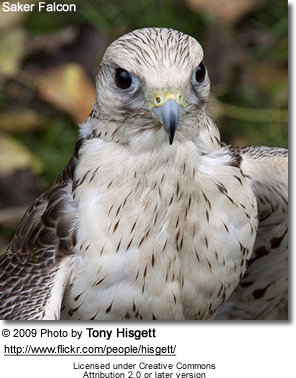 Probably the saker falcon (Kerecsensólyom) was the Hungarian mythological bird, the Turul. 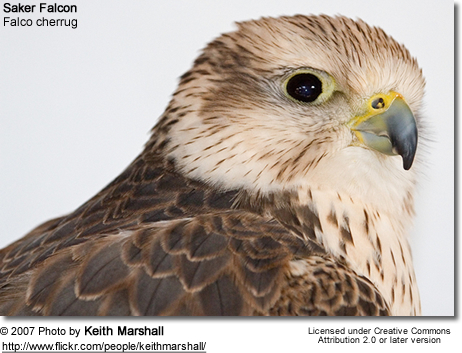 The Saker Falcon is a raptor of open grasslands preferably with some trees or cliffs. It often hunts by horizontal pursuit, rather than the Peregrine's stoop from a height, and feeds mainly on rodents and birds. In Europe, Ground Squirrels and feral pigeons are the commonest prey items. This species usually builds no nest of its own, but lays its 3-6 eggs in an old stick nest in a tree which was previously used by other birds such as storks, ravens or buzzards. It also often nests on cliffs. BirdLife International categorises this bird as endangered, due to a rapid population decline, particularly on the central Asian breeding grounds. The species faces pressure from habitat loss and destruction. The population was estimated to be between 7,200 and 8,800 mature individuals in 2004. In the United States there are several captive breeding projects. 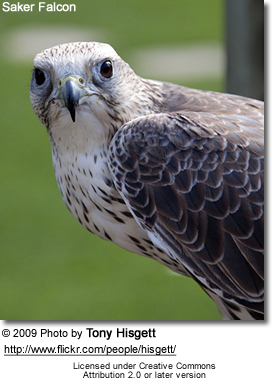 There are currently several successful breeding projects by falconers in Canada. 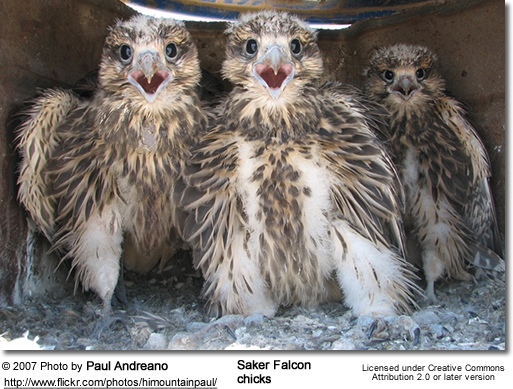 The most dramatic decline of the Saker falcon in Asia has been in Kazakhstan and Uzbekistan. On the contrary, a strongly protected and relatively abundant population persist in [Hungary]]. Please scroll down to view distribution map. 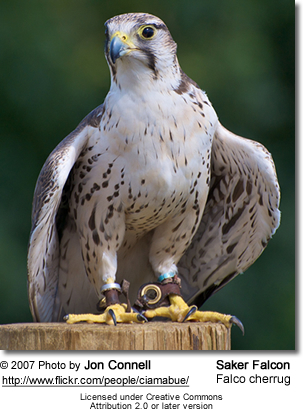 Saker Falcon is the national bird of Hungary, known as Turul in the Hungarian mythology.